So you’ve finally cleaned out the ol’ garage to make way for your new home gym. There is no more essential piece of equipment for a home gym then a good power rack (maybe a cable system!). In it, you can do safe and solo squats, bench press, deadlifts, and much much more. 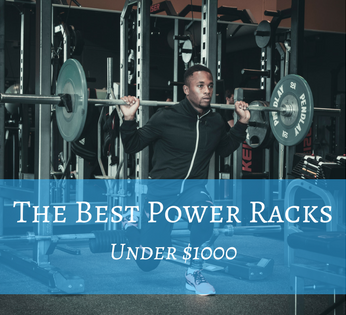 Let’s dive into my breakdown of the best power racks under $1000 (Amazon links below). There’s not a whole lot of mystery or intrigue about what makes a great power rack. Essentially, a power cage is just a bunch of powerful steel that can hold incredibly heavy amounts of weight so they don’t fall on you while you’re lifting! For this reason, most name-brand power racks these days will work absolutely fine for your home or garage gym. Still, there are a lot of subtle features and options to consider if you want to get the absolute most bang for your budget. If you’re buying a power rack, chances are you’ll need at least one barbell, an olympic weight set, an adjustable bench, weight clips, and more, depending on what kinds of workouts you’re looking to do in your home gym. All that extra equipment can really add up, but sometimes you can get a great deal having many of these things bundled into the overall package when you order your rack or power cage. Safety hole spacing is a really important and often overlooked feature of power racks! Narrow hole spacing gives you a lot more options and flexibility when setting up your lifts, while holes that are far apart can make it difficult to find the perfect fit and compromise your safety during heavy sets. Generally speaking, the more safety holes (and the closer together) the better. You’ll be able to set the j-hooks and safety pins exactly where you want them. There are some pretty important distinctions between half and full power racks. Half racks take up significantly less space (see image below) and give you more flexibility for Olympic style lifts and overhead pressing. They also offer a lot less safety options and stability, and are less than ideal for squatting and bench pressing, as opposed to full power cages. Consider what style of lifting you need your home rack to accommodate. When all else fails, I like to go read what real people on Reddit have to say about certain power racks! Overview: The Deltech Fitness DF4500 power rack is a great bundle option that includes an olympic barbell and 300 pounds worth of free weights (two 45lb plates, two 35lb plates, two 25lb plates, two 10lb plates, four 5lb plates, and two 2.5lb plates), along with spring clip collars / weight clips. This is a fantastic bundle for anyone just getting started in their home gym and should keep you busy for a while before you need to buy additional weights. Why I Like It: The DF4500 looks incredibly sharp and is extremely sturdy. Fully adjustable safety pins and front-facing J-clips give you incredible flexibility in the number of lifts you can perform. 300 pounds of weight is plenty to keep beginner and intermediate weight lifters happy and properly challenged. Reviewers Like: Reviewers write that this home power rack is super sturdy and can hold significant amounts of weight. Potential Drawbacks: The DF4500 doesn’t come with a bench, which is a shame. That would have really rounded this out into a truly fantastic bundle. Reviewers also noted the rack set may get a little banged up during shipping, and delivery has to be scheduled because it’s such a large item. Rack may be a little bit short for taller individuals. Overview: The Titan T-3 is a heavy duty half rack that’s perfect for squatting along with many Olympic movements. It has a built-in pull up bar and safety spotter arms that give it a lot of versatility and ability to replicate a full squat rack. Why I Like It: This thing is HEAVY duty and is rated to handle over 1,000 pounds. Unlike many half racks, the safety spotter arms jut out to give you support during squats and other heavy movements, but you’re also free to remove them or back away and lift without support or restriction. Pin holes are extremely close together and you’ll have no trouble lining up your lifts perfectly. Reviewers Like: Extremely sturdy construction and a feeling of safety when using the rack. Set up is a breeze. Plate storage pegs are a great bonus. Prime shipping gets this rack to you fast. Potential Drawbacks: Pull up bar hangs a little low for tall folks or for kipping-style pull ups. Set might be banged up a bit in transit. Plate storage pins can potentially interfere with certain lifts depending on placements. Overview: The Valor BD-11 is a great, heavy duty, traditional squat rack/cage that’s perfect for most home gyms. It includes front and rear J-hooks for lifting versatility, safety bars, and an angled pull up bar up top. It’s also rated for very, very heavy weights and highly unlikely to bend or break. Why I Like It: This thing is simple, sturdy, and effective. Like I wrote above, you don’t need a whole lot of fancy extras when it comes to a power rack, just something reliable that will keep you safe without a spotter. This fits the bill and has the positive reviews to back it up. I like the pin hole distance and front facing hooks for extra versatility in the workouts you can perform with this rack. Reviewers Like: Rack is packaged very well for shipping and arrives in great condition. Height works well for taller lifters and pull-uppers. Compact design is spacious but doesn’t take up too much room. Plenty of add-on and bundle options. Potential Drawbacks: Color is less than ideal and it’s not the prettiest rack. Plate storage may be in the way during bench press. Set up can be confusing and difficult, especially solo. There are many wonderful, well-constructed, and well-reviewed power racks available for your home gym, regardless of your budget. Choose the one that makes the most sense for your style of lifting, available space, and strength level. If you have advice you’d like to share with others, or a recent experience buying a power rack under $1000, I’d love to hear about it in the comments! 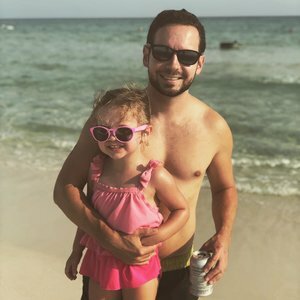 I’ll be improving and updating this post plenty in the future. Did I miss anything important above? If so, I’ll try to add it to this section. How much do power racks cost? Wooh, that’s a big question! They can cost anywhere from the low hundreds to multiple thousands of dollars, depending on too many factors to list. But a few things that can make power racks more expensive are super high quality and durability, bigger size, higher weight capacity, more features and add-ons, included equipment, smaller hole spacing, higher gauge steel, full rack vs half, etc. There’s no easy catch all answer to how expensive a power rack is, so the best thing to do is determine your budget and available space and go from there. How big is a power rack? I have a whole article on power rack size that should help! And the specific dimensions of my favorite racks are all listed above. What if I’m really on a budget? You can always get used power racks and other home gym equipment on Craigslist. Sadly, a lot of people buy this stuff and never end up using it, or they don’t have the room for it, or they decide to upgrade their home gym and have to get rid of the old stuff. A new rack has some obvious advantages, like warranty and buying exactly what you want, but if you want to save a lot of money, look around your area for used racks on Craigslist. How do I put together a power rack? This really all depends on the rack. But it helps if you’re a little handy and have some basic tools around. Pay attention when shopping as to whether the rack needs to be mounted on the wall or in the ground for stability purposes. Sometimes, with fitness equipment ordered online, you can pay extra to have it arrive assembled and ready to go. So check for that option, as well, if you need a hand. Are power racks worth the money? If you have the space and budget, yes! A rack, and Olympic bar, and some free weights are all you need for an amazing full body workout. You can do squats, presses, pull ups, curls, and more inside a squat or power rack. Add in a bench and you can do even more. You can always add more accessories and equipment to your gym when needed, but it’s an awesome start and can easily replace your gym membership. Plus, working out at home is just so mind-blowingly convenient, even an expensive power rack should pay for itself in short order. What if I can’t afford a power rack? Like I said, you can look at online marketplaces like Craigslist for used equipment that might come a lot cheaper, or even free in some cases. Dumbbells probably aren’t a cost effective replacement for a power rack because they can be really expensive, take up a lot of room (for a whole set), and are much more limiting in what you can do with them. The other alternative would be to find a very simple gym near you that has a good weightlifting section. In the long run, it’s more expensive that way, but it might be easier on your budget to pay around $20 per month over time rather than hundreds or thousands of dollars up front.